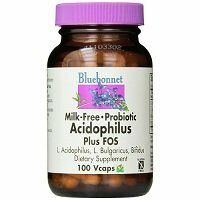 Bluebonnet Probiotic Acidophilus Plus FOS comes in at 2 out of 5 stars. It has some potential but overall didn’t make the cut (even as an average probiotic supplement). I’ll quickly go over the few things I like about this probiotic. It’s super affordable and only requires 1 capsule daily (which happens to be vegetarian). A major thing I like is how allergy friendly it is. It’s free of all the main allergens like milk, yeast, gluten, soy, wheat, and nuts. This probiotic is also really clean, there’s no artificial junk or preservatives. I like that is uses some solid probiotic strains and includes the prebiotic FOS. But that’s the end of what I like about it. So now it’s time to go over what I don’t like. First and foremost, it’s just too gentle of a product. It only has 3 billion CFU and 3 strains. I have IBS and rely on probiotics to get me through the day and unfortunately with this one I just didn’t see much (if any!) relief from my symptoms. I like my probiotics with more strain diversity and higher CFU counts. That being said, this may be a good option if you’re new to probiotics. I think it could be a nice introductory supplement to get your feet wet. Another huge inconvenience is that this probiotic requires refrigeration. It says to store it between 36° F and 46° F.
This is such a pain! Also, it’s hard to tell if it’s been refrigerated the whole time after processing and shipping, etc. The last thing we want to do is pay for dead bacteria! Also, I really don’t like that I couldn’t find a guarantee. Overall, it had some potential but too many strikes got in the way of me giving it a higher rating. Each serving of Probiotic Acidophilus Plus FOS (1 capsule) has 3 billion CFU in 3 probiotic strains. I like all the strains that they use in here. In particular, I like Bifidobacterium bifidum in the lineup. Studies suggest this strain may help boost digestive and immune function. Research also shows that it may relieve ulcerative colitis, Irritable Bowel Syndrome (IBS) symptoms, constipation, diarrhea, stomach problems, and eczema. Recent studies point to its ability to lower bad cholesterol. Not too shabby! Another strain that’s used (which I’m a particular huge fan of) is Lactobacillus acidophilus. This strain is a leader among friendly bacteria. Research shows its ability to alleviate common digestive issues like gas, constipation, diarrhea, and bloating. Studies suggest it may help balance the good and bad bacteria in the gut (which can easily get out of whack, especially while taking a round of antibiotics). Other benefits of Lactobacillus acidophilus are that it may prevent urinary tract infections (UTIs), relieve traveler’s diarrhea, and treat yeast infections. This supplement includes 100 mg of the prebiotic FOS. It’s a special carbohydrate made from chicory root extract. It helps promote the growth of good bacteria in the digestive system. This probiotic is very allergy friendly. That’s a huge plus in my book because I suffer from a myriad of food allergies and intolerances. That make a big push to let you know the product is milk-free (it’s on the front and back of the bottle and mentioned multiple times on the website). It’s also FREE of milk, egg, fish, crustacean shellfish, tree nuts, peanuts, wheat and soybeans. In addition, it’s FREE of yeast, gluten, barley, rice and sodium. This probiotic is made with NON-GMO ingredients and the capsules are vegetarian. The other ingredients include: Kosher vegetable capsules, vegetable cellulose, and vegetable magnesium stearate. A bottle of 100 veggie capsules will last you 3+ months and cost you $22.91. You only take 1 capsule daily so it works out to 22 cents per day to take. It’s definitely among the most inexpensive probiotics I’ve tried. I’m all for a good deal but in this case you get what you pay for. I don’t think you get a ton of value out of it and there are much higher quality probiotics out there. I wasn’t expecting any either because this product is super gentle. Unfortunately, I think it’s a little too gentle. I don’t think it was potent enough to be effective for me. I couldn’t find any type of guarantee on Bluebonnet’s website. You can buy this product in grocery stores such as Sprouts and various places online like Amazon. Certain retailers may have their own guarantees (or at least return policies) in place, so check with the individual store or website. To buy Bluebonnet Probiotic Acidophilus Plus FOS, click here.